The mobile gaming industry has multiplied within these few years and has changed the way of business function. The gaming industry is huge, and it is growing on a regular basis which raises the demand for professional game app developers. Along with the rapid innovation of mobile devices across different platforms, a number of games are being developed that keeps the game lovers engaged with their devices for a longer time. The developers use different game engines for developing game apps. These game engines are the software frameworks which integrate the basic elements of the game like 2D/3D graphic rendering, AI, sound, and animation. A lot of game engines are available for the designers. The designers use this for coding a game easily with faster turnaround time. If you are a game app developer and designer, you must be aware of the best game engines. Below mentioned are the top game engines that are popularly used for game app development. Unity3D is one of the most popularly used game engines used by the game designers and developers across the world. It offers unmatched advantages in comparison to other game engines. One of the incredible features of Unity3D is that the developers have to pay once for obtaining the license and then there are no extra charges in future. Unity 3D is highly beneficial for start-ups. Unity 3D is quite easy to use by the new developers. It is compatible with every game platform. Unity 3D offers best license terms. It does have great community support. Though this game engine offers amazing benefits, it does have few drawbacks. Limited tools and high time consumption are the essential drawbacks that do have diverse effects on the game development process. Recommended reading: 5 Best Programming Languages for Mobile App Development. Unreal Engine is a widely popular game engine that is used by the developers for developing AAA games. Popular gears and blockbuster games are developed on this engine. Unreal Engine offers the largest community support. Lifetime video tutorials and assets. With each update, a new tool is introduced. It integrates the widest range of tools that can easily be learned without having any proficiency. It is compatible with diverse mobile operating platforms. If the game makeover exceeds $5000, then the developers need to pay 5% royalty apart from the fees of licensing. Some developers complain about certain unfriendly tools. This game engine does have a higher learning curve as well. Cry Engine is regarded as a powerful game engine. Games developed on Cry Engine can be hosted on different platforms like Android, iOS, PS4, PS3, PC, Xbox 360, Xbox One and Wii U. Developers can easily sign up and use the engine by paying monthly fees of $10, and the developers don’t need to pay any royalty. This engine is loaded with incredible features like physically-based shading, image-based lighting and geometry cache. The performance of the games developed on Cry Engine is high. Graphics can easily be customized with little effort. Developers can easily develop simple games without writing complex codes. 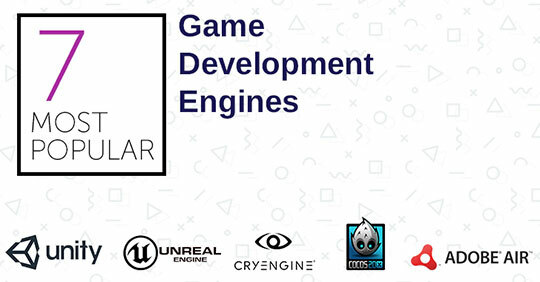 Cry Engine does have a steep learning curve for which new developers would find it challenging to develop games. The games probably can get affected by surprising bugs, and this engine does have low community support. This game engine does have a wide range of feature set. The native language works ensuring the faster result. Game apps can be developed for major platforms. Though Cocos2D-X is quite friendlier, slower debugging is the drawback of this game engine. You may also like: 10 Best Mobile App Development Tools – A Preview. Citrus Engine is a quite scalable ActionScript 3 game engine that is built for developing high-quality game apps. This engine is designed on modern programming practices that allow the developers to focus on making the awesome game. This engine does have an inbuilt starter kit that helps in developing 2D and 3D side-scrolling games. Citrus Engine is designed for making all types of games. This engine offers rendering choice to the developers like Away3D, Bitmap blitting, display list, etc. Managing object creation is quite simple on this engine. The load manager and level manager may use the Flash Pro as its level editor. Adobe AIR is one of the best cross-platform game engines that are developed by Adobe Systems and widely used for building mobile as well as desktop applications. This is programmed with ActionScript, Adobe Flash as well as Apache Flex- optionally. Starling, Away3D and Stage 3D are also few of the engines that are provided by Adobe AIR. Oxygine is one of the free and open sources 2D game engines that is available on BitBucket. Oxygine is written in C++. With its flexibility on resource management systems and automatic sprites batching with memory pools, the developed games can be hosted on different platforms like Android, iOS, Windows, Linux, and MacOSX. This article is written by Vivek Shah. He is the founder and CEO of Capermint Technologies, A leading BuildBox, and Unity3D game development company. As a CEO, he likes to help other brands to transform their mobile game ideas into reality.